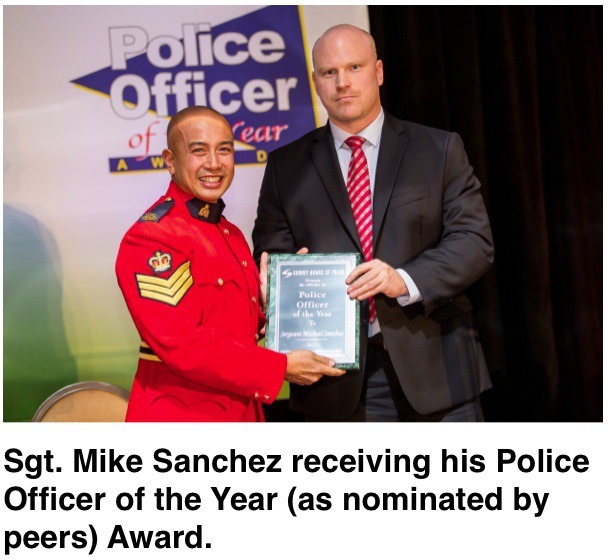 Surrey Board of Trade hosts 2015 Police Officer of the Year Awards. Surrey RCMP Insp. Ghalib Bhayani was named Police Officer of the Year - Nominated by Community at the 19th-annual Surrey Board of Trade Police Officer of the Year Awards on Thursday night. You may recognize Insp. Ghalib Bhayani from your local coffee shop, where he’s been meeting and chatting with the public this year for a series of community outreach sessions. Within the Surrey RCMP, he is known for his dedication, work ethic and role model skills. He also speaks four languages. But since early summer, he has led the Surrey RCMP’s Community Mobilization process, more commonly known as Coffee with a Cop sessions where he and other officers speak to residents on issues affecting their neighbourhoods. It’s this outreach that helped earn Bhayani the Police Officer of the Year – Nominated by Community award on Thursday evening. Bhayani was among nine people and organizations honoured at the 19th-annual Surrey Board of Trade Police Officer of the Year Awards. Also named Police Officer of the Year – Nominated by Peers, was Sgt. Michael Sanchez, who was commended for his “innovative and collaborative” approach to policing in the City Centre neighbourhood. As A Watch Senior NCO in the area, he has developed and overseen several initiatives, including one with Surrey Community Corrections to monitor people on probation who are living in Surrey. Brought together by the Surrey RCMP and Transit Police, the pair has worked collaboratively to enhance police presence and improve public safety at Surrey Central SkyTrain station. Reid works with the Cloverdale/Port Kells District 4 and is involved with the Speed Watch Team, Lock Out Auto Crime audits, Distracted Driving campaigns, and the Pack the PC event. An initiative started in fall 2014 that has tackled auto crime and improved security at Guildford Town Centre. As a Victims Services caseworker, Neal assists people through some of the most difficult times of their lives. She often goes above and beyond and played a role bringing a trauma dog to the Surrey detachment and created a bereavement and critical incident response guide. The society, with its 300 volunteers continues to expand programs, support special projects with community groups, including a recent partnership with Transit Police. The awards were handed out Oct. 8 at the Sheraton Vancouver Guildford Hotel.